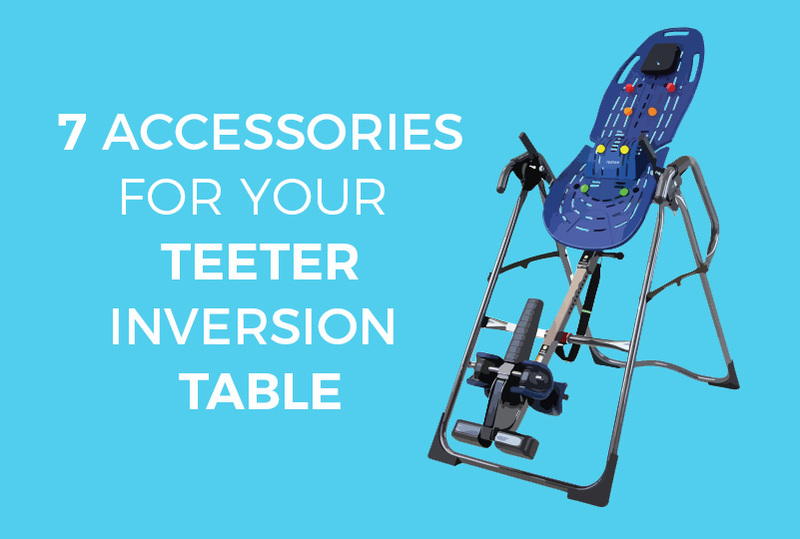 There is no doubt that inversion tables from Teeter are the most customizable available, with a wide variety of accessories that can be added. Some of the accessories below are included in the LTD packages on certain Teeter models but they can all also be purchased separately. 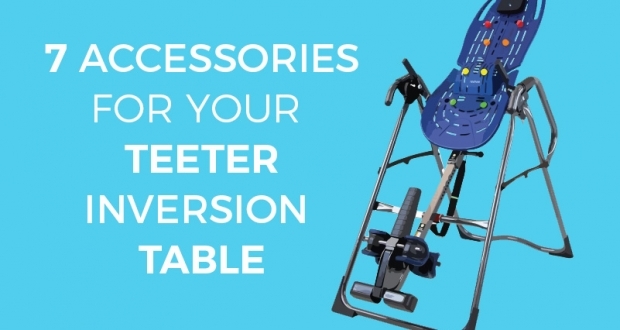 If you are looking to enhance your Teeter inversion table or are simply looking for what options are on offer should you purchase a Teeter inversion table, you should find an accessory below that is likely to be a very useful addition. The colorful acupressure nodes come included with the EP-560 and EP-960 Ltd inversion tables packages from Teeter, but are also available to purchase separately should you already own a Teeter table. The 8 acupressure nodes feature 4 sets of 2 nodes that each vary in height to provide varying degrees of pressure. The acupressure nodes can be added to any Teeter inversion table that features the trademark ComforTrak backrest or one of Teeters flex technology models. You can attach the nodes onto the backrest via the various ridges that feature on the ComforTrak backrest. This provides a wide range of placement options to focus the nodes anywhere along your back. Each node features an easy to use twist lock mechanism allowing for easy adjustment, easy installation and hassle free removal. You can either use the nodes while inverting at an angle to apply continual, steady pressure to an area while you are static. Or you can rock up and down upon the nodes to apply a shiatsu style massage. 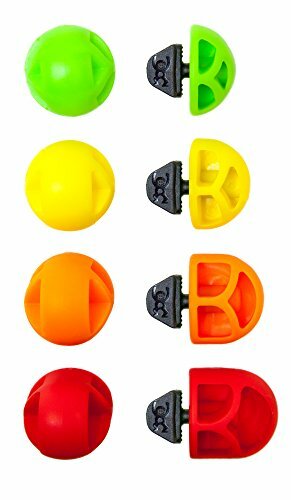 As with many Teeter products these simple little accessories have gained very good reviews from buyers, many of whom state how effective these nodes are. Much like the acupressure nodes above, the lumbar bridge from Teeter comes complete with the limited packages for the Teeter EP-560 and 960 models. It can also be bought separately and used with any Teeter table that features the ComforTrak backrest. The lumbar bridge can be attached to the ComforTrak bed via the numerous horizontal slots situated on the lower/middle of the backrest. The addition of numerous slots in which to place the bridge, allows the user to choose how much of an arch the bridge provides. You can use the support bridge to provide a small and subtle curve or adjust it to protrude further out, depending on your individual preference or needs. The idea behind the lumbar bridge is to give the user added support and traction, as well as a deeper decompression to their lower back while inverted. You can also add the acupressure nodes (above) onto the lumbar bridge should you desire. It is worth noting the lumbar bridge is not a hit with everyone! While some love this simple accessory and love the feeling it provides others find it a discomfort and a waste of time. We advise you to give the user reviews a quick read before deciding on a purchase, just to double check if this seems a suitable accessory for you. The Teeter comfort cushion can be used with any FlexTech Teeter inversion tables or any Teeter tables that feature the ComforTrak bed. The foam padded comfort cushion features a high quality microfiber shell that is moisture resistant. It can be easily and securely attached to the backrest using the included fastening nodes. The cushion provides a comfortable support that conforms to the users body contours and minimizes pressure points. The ComforTrak bed from Teeter has been designed in a way to allow for less friction and less resistance when inverting, this allows for more effective decompression. Due to the microfiber design of this comfort cushion, adding it to the bed will still allow the body to slide effortlessly and still grant very effective decompression. The comfort cushion can also be used in addition to the lumbar bridge as you can see in the picture to the right. Many who have used the comfort cushion with their Teeter inversion table are very impressed, agreeing that the padded support is a very welcome addition to enhance an already excellent inversion table. 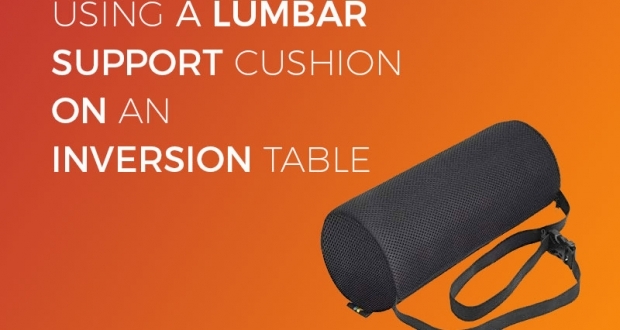 Much like the Teeter comfort cushion listed above, this massage cushion provides a flexible and supportive padded surface that fits the contours of the users body. 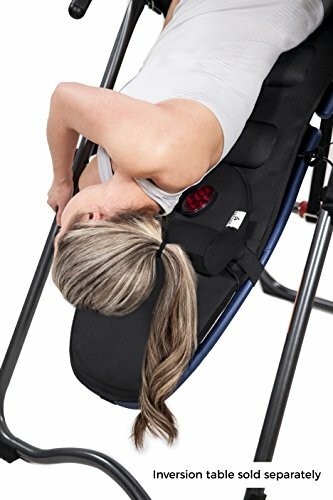 The poly foam padding is covered in microfiber material and therefore still allows for great spinal decompression as your body slides down the inversion table. This Teeter support cushion features 10 variable intensity vibration motors to provide the user with a vibration and pulse massage. 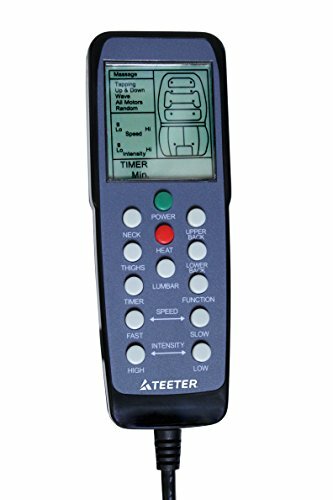 The intensity, duration and speed of the massage can be controlled by the LCD remote. Via the remote you can also target problematic areas such as the thighs, neck and upper or lower back. The LCD remote also comes complete with a handy pouch that can be attached to the side of your Teeter inversion table to keep it conveniently at arms reach. The Teeter massage cushion is suitable for use with all Teeter inversion tables and can be attached to the inversion table via elastic straps that wrap around the tables bed. Included with this cushion, is a neck arch support which features 2 infrared heaters to provide deep heat to the upper back and shoulder area. The neck arch support is also useful for allowing greater decompression to the neck while inverting. 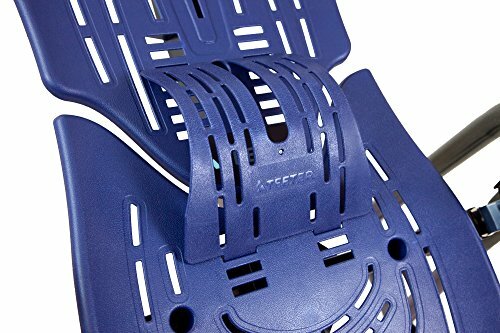 According to Teeter, studies have shown that the use of this vibration massage technology can help to temporarily reduce muscle pain and improve blood circulation. The heat provided by the neck arch can also provide circulation benefits. Much like the lumbar bridge accessory, this is a Teeter accessory that some love, while others seem unconvinced. The main complaints mostly focus on the lack of power from the heat and vibrate functions. A complaint that is often found in reviews for other inversion tables that feature these added extras. Be sure to check the buyer reviews at the retailer to form your own opinion before committing to a purchase. 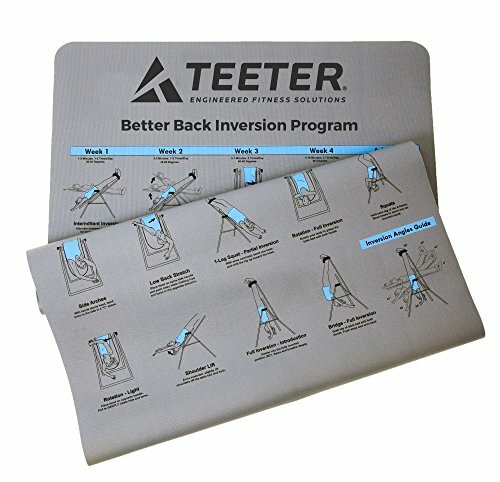 The inversion program mat is not so much an accessory, but it is a useful guide to follow when doing stretches and exercises on a Teeter inversion table. This large mat can be placed under your inversion table while you are using it. It features 24 illustrated movements, stretches and exercises that can be performed as well as an inversion angle diagram. The mat is made from extra strong, washable material and provides non skid protection when used on hard floors. It can also double as a yoga mat. The mats overall dimensions measure 60 x 36 x 0.16 inches (L x W x H). 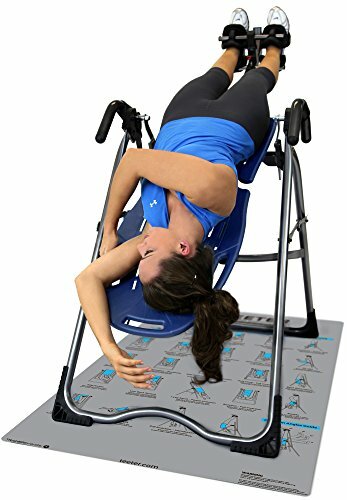 The main benefit of this mat has to be the fact that you have a quick reference to a wide range of stretches to do on an inversion table. If like me you often have trouble keeping up with exercises you watch on videos or find it hard to retain the information you see this is a nice solution to have on hand. 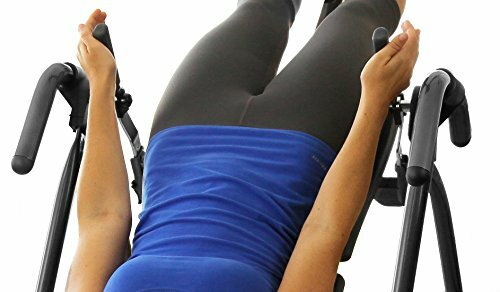 The Teeter EZ stretch traction handles are already included on the Teeter EP-960 inversion table and EP-970, but you can now add this useful feature to other Teeter inversion tables(with a standard pivot feature) also. The addition of the traction handles allows for further stretching and decompression from your Teeter inversion table. They also provide additional aid in returning to the upright position while inverted. 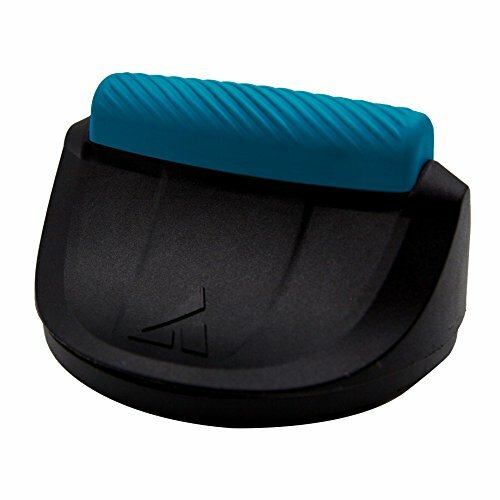 The rubber hand grips can be used to apply additional pressure when inverting. 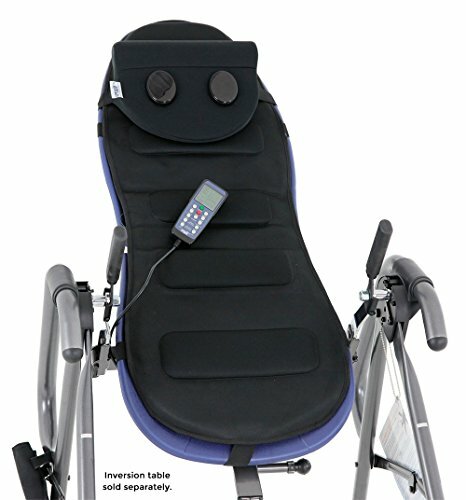 They can also be used to provide rhythmic oscillation and intermittent traction while you are on the inversion table. The handles are easy to install and provide some nice additional stretching options to Teeter models such as the EP-560. 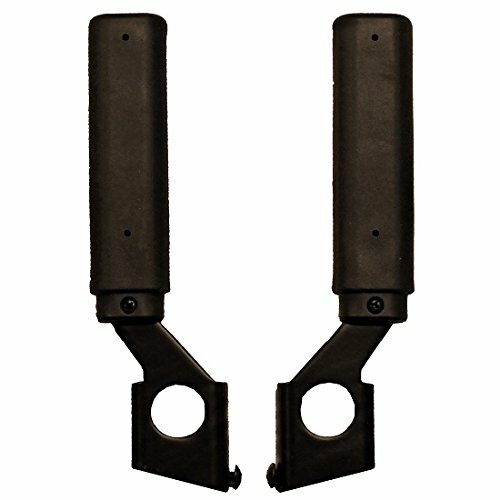 As with most of the Teeter accessories available many find these traction handles very useful, however a minority feel they are not overly necessary. In our opinion anything that adds further stretching options to an inversion table can’t be a bad choice. 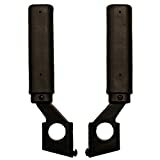 But as always be sure to read the buyer reviews to confirm if these traction handles may be a good fit for you. 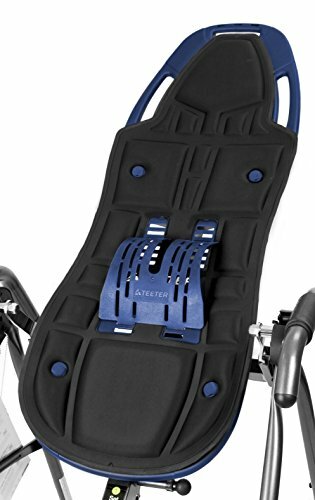 The Teeter neck restore is suitable for use with Teeter inversion tables that feature ComforTrak or FlexTech backrests. It can also be used while lying on the floor on a firm flat surface. The Teeter better back neck restore is designed to provide support and reduce pain/tension in the neck, shoulders and upper back area. Allowing the user to loosen tight neck muscles and provide tension relief. 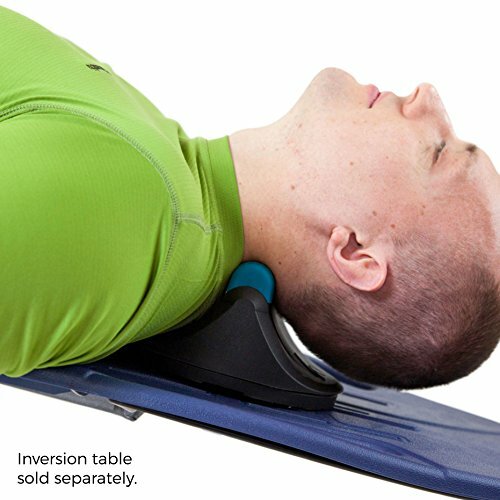 Adding this neck restore accessory to your Teeter table allows you the option of not only decompressing your spine, but also your neck while inverting. When used on a Teeter inversion table, the device can be attached to the backrest on models such as the EP-560 and the EP-960 (both featured in the inversion shop area) via Velcro straps that loop through the slots in the bed area. The blue rubber bar running along the top of the neck restore accessory is removable. This makes it easy to clean and allows you to put it in the freezer for more cooling neck relief when you next use it. The disc shaped part of the accessory also rotates allowing the user to move their head from side to side in order to enhance cervical decompression should they wish. Opinions on the Neck Restore device are a little mixed. Many who use the device seem to love it, while others feel it is fairly uncomfortable. Although this accessory may take a bit of getting used to due to it being a little uncomfortable at first, those who persevere are likely to find this is a wonderful accessory that does exactly what the manufacturer states.